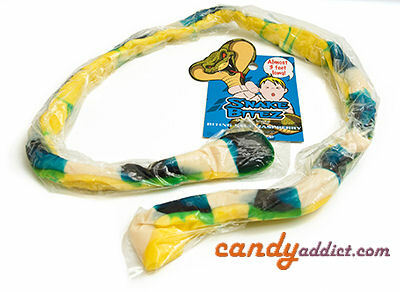 I love gummi candies so I said “yes please!” when I was asked to try a gummi snake. You should have heard the whoop I let out when this thing arrived: it’s almost THREE FEET long. To put it in perspective, for anyone under 6 feet (like me) that’s, like, half our height in gummi goodness. 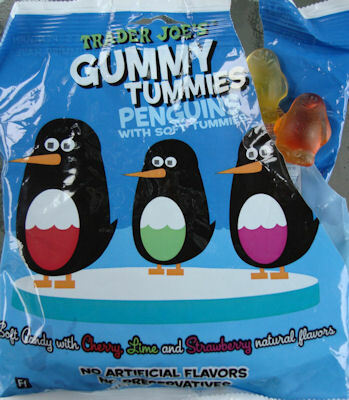 Now, I love me my gummies, but even I couldn’t eat this thing in one sitting – not that you’re supposed to, the serving size says there’s 4 servings per container. Still, my inner child was giggling with glee at the thought of downing this monster. The candy offers quite the visual beyond its length. The blue raspberry flavor that I tried was composed of opaque white and yellow patches, and transparent blue patches. You even get green bits where the blue drips onto the yellow. And get this: when you bite into the snake you find out that blue part also runs all the way through the middle of the snake from tip to tail. Since it’s a gummi candy, it wiggles and jiggles, giving it an “ooh” factor… or an “eww” factor, if you’re feeling particularly squeamish. Personally, I loved it and I can see sassy little kids going mental over this. Ah, but how does it taste? In a word: good. My snake had a good, consistent blue raspberry flavor. It leaned toward the sweet side, but in a good way that didn’t annoy me or overwhelm the blue raspberry flavor. 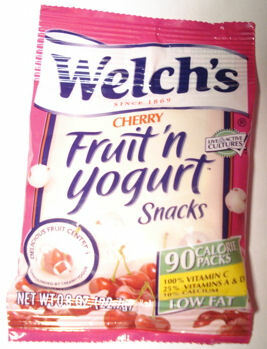 The texture reminded me a bit of a really firm marshmallow – spongier than some gummies I’ve tried, yet still with enough firm chewiness to make it fun. Since I’m a big kid, I like to play with my food, so I gotta tell you I had a ball pulling and twisting my snake – it’s a bit like taffy in that it’s malleable and the more you play with it, the stickier it gets. Also, I found it extra fun to bite the head off the snake! Bonus: it turned my tongue blue! 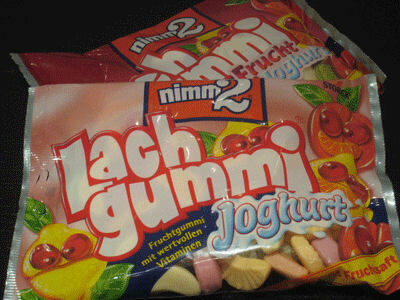 All in all, this is a yummy, fun gummi candy that pays off in taste, texture, and sheer size.